The chorus is meeting at The Grand on the square in Mt. Vernon for a coaching retreat with David Calland this month - this will be such a good learning experience as we get ready to perform at our regional competition in May! We will also work on some choreography to enhance our performance. To top it off, the retreat will give us more time to enjoy our "sisterhood" and fellowship with one another - always a fun time with lots of laughter. The chorus has been "maintaining" our normal business too! We elect board members each year and vote for our "Sweet Adeline of the Year" to honor someone who has been a terrific asset to the chorus. We'll announce our new leadership in a month or so. We also take part in electing the international board of Sweet Adelines International. AND we will perform at the Ohio Eastern Star campus on Tuesday evening, April 23. Eighteen of our members attended Harmony Weekend, a regional educational event, at Sawmill Creek Resort in Huron OH in February. Three of our members were recognized with pins and certificates for their length of membership in SAI. 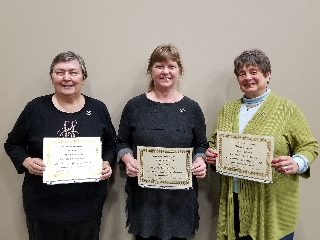 Susie Noland and Marianne Watkins both were honored as 25-year members and Donna Dudgeon was honored for 50 years of membership. Donna has been director of Dogwood Blossoms Chorus for over 25 years as well - she must have started when she was a toddler!!! As we look forward to warmer weather, come ward off "cabin fever" with us! 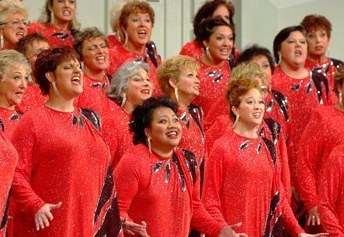 The chorus welcomes women and girls who like to sing to visit us at a rehearsal on Tuesday evenings at 7:00 pm at Central Christian Church, 17833 Gambier Rd. (Rt. 229 East) in Mt. Vernon OH. It is not necessary to read music - we'll provide learning tracks and lots of help as needed. AND we promise that singing with our chorus is LOTS of fun! What better way to welcome spring than to be in the warmth of friends and music? Marianne, Susie and Donna show off their longevity awards - CONGRATULATIONS!!! Watch or "like" our page "Dogwood Blossoms Chorus" on Facebook for day-to-day information. Call (740) 720-3221 for more information! 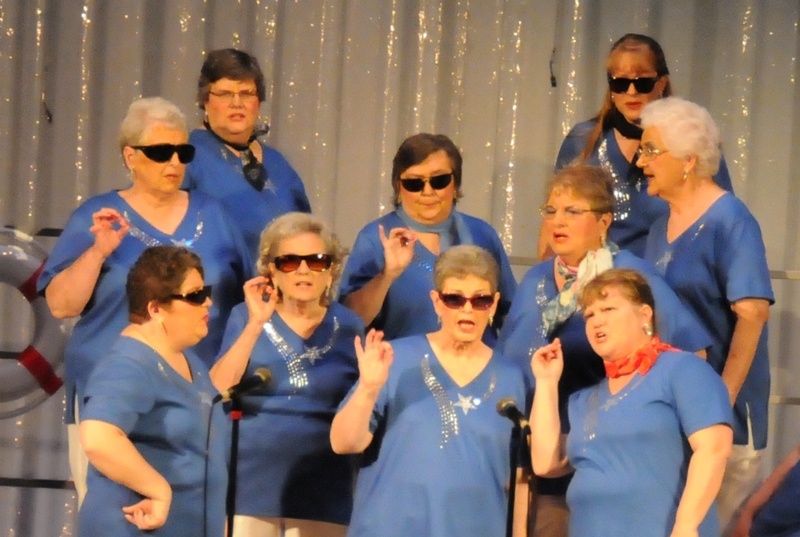 Dogwood Blossoms Chorusis an extraordinary group of women who gather together in celebration of the art form known as barbershop music - we sing 4-part harmony music, a cappella style, in several genres. We are a chapter of Sweet Adelines International. We can be heard throughout the year, singing for civic and charitable organizations, private groups, churches, community events, and fundraisers.